The ruling All Progressives Grand Alliance (APGA) took an early lead in the Anambra gubernatorial election held yesterday. 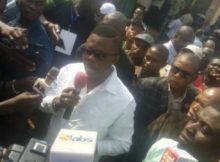 Early results show incumbent Governor Willie Obiano and his APGA clinching victory in most of the polling units which results have been announced since voting closed Saturday evening. With the All Progressives Congress (APC) chasing by some margin and the Peoples Democratic Party (PDP) following closely behind. The election had proceeded without catastrophic hitches that marred previous elections, earning the Independent National Electoral Commission (INEC) and security agencies the praise of most of the candidates and their parties. Residents of the state turned out in large numbers in most of the polling units to cast their votes, disregarding calls and threats by the proscribed Indigenous People of Biafra (IBOP) for people to boycott the elections.